With all the forth coming HW2 sets I thought I would add a few to the list. We are pleased to have the first recorded Arp Schnitger virtual organ set for Hauptwerk 2. 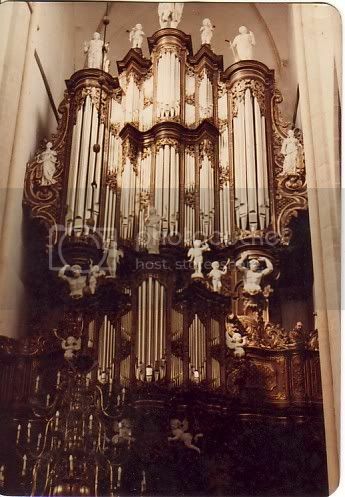 The fine and nearly all original organ of 1680 located in Cappel, Germany at the St. Peter and Paul church. The organ contains 30 stops over 2 manuals and pedal. All in all it is quite a versatile instrument with a wide variety of tonal resources. There is no mistaking the north German Baroque sound on this instrument. (copy of Schnitger's at Steinkirchen). Originally the organ was situated in St. Johannis church in Hamburg and then placed into storage for many years. The church in Cappel decided to purchase the organ in 1816 to replace their old one. Many of the decorative statues found on the top of the organ had to be removed to fit the organ case in the space provided. The removed statues are now located above the altar at the front of the church! Recorded back in 2003 this is technically the first Schnitger organ sampled! ;) For several reasons the project has been put off here and there and now has finally had the chance to come out and play! We'll be working on getting it released in the very near future, most likely before Christmas. Here are some short demo clips which were recorded over a year ago in an early version of Hauptwerk 2. Note that the acoustics are quite short as the church is not a very large one. This means many things and number 1 means you do not need a workhorse PC to run the set. Number 2, the releases are quite fine with only one release recorded (again it was done back in '03 before anything was known about multiple releases). You will especially hear this in the G Major Fantasia clip with the fast running scales. Thus the entire organ will load easily wth the proper options in HW2 in under 2GB, perhaps under 1.5GB. Again, these were recorded a long time ago without any wind system settings. Of course once completed the organ will have a much more real sound. Next up is the Hinsz/F.C. Schnitger organ of the Bovenkerk in Kampen, Netherlands. And last but certainly not least! The third project will be recordings from the Notre Dame de Metz in Metz, France of the Mutin-Cavaillé-Coll organ with 38 stops. Another wonderful instrument sounding nearly as it did when it was re-built in 1903 by Charles Mutin and Cavaillé-Coll. Again, this will be due out in '07. More information will be offered later for all instruments! Last edited by B. Milan on Sun Oct 22, 2006 5:01 pm, edited 1 time in total. Wow that is quite a coup. All those wonderful organs! The Bovenkerk happens to be one of my favourites. It is absolutely brilliant and the acoustics there are unbelievable. I think I'll have to break into my piggy bank and get them all. I just listened to the Schnitger recordings. What a beautiful sound. Excellent recordings too. As you said the reverb is just perfect and you really do not miss the multiple release samples. I also looked up the Metz organ on the internet - very nice. It looks like you picked a few really good ones. All the Hauptwerkians will be impressed I'm sure. Definitely another few for my collection. This is the same organ that Helmut Walcha recorded his first cycle of Bach organ works on! If you have the CDs the first track is actually Walcha improvising on this very same Cappel organ with different registrations which are spoken out aloud as they are set. wow, I still can't believe you were able to sample this instrument, it will definitely be a nice Christmas present! It's in French, but there is a very detailed stoplists, mp3 files, even videos. Hooray for the coming Bovenwerk organ in Kampen! statues. You can just see my face IF you look carefully. Looking forward to the coming sample set and ODF! As far as I know it mainly had to deal with repairs of the wind chests and bellows due to the new heating system being installed in the Cappel church. I think these few new projects will be enough for a long while for us! Thank you for the comments, I appreciate them. I'm glad you like the sound of the Cappel Schnitger, it is truly a unique organ and considered among the best of Arp's works! It was actually quite difficult having to sample the organ since one just wants to sit and play music on it all day long! Reverb time is about 1.5 to 2 seconds, so very short which is great for "lesser" computers to be able to run the entire instrument at once. Kampen: Are you recording the entire organ, including the later additions? Leeuwarden, Chr. Muller organ-extremely nice! Great room! Helmond, French baroque in glorious acoustics. Slurp... a new Cavaillé-Coll (ehm, Mutin..)... can't wait to add it to my organs..
Last edited by Aristide on Thu Feb 01, 2007 6:04 pm, edited 1 time in total. will it be possible to use the samples from the Schnitger with Oberwerk? All of our HW2 sets may be used with Oberwerk 2 and that is the reason that the .hbw feature was implemented in Oberwerk 2. Personally I wouldn't want to combine the samples with other instruments and would want to keep it as it was meant to be on its own. However, that is your choice and the beauty of Hauptwerk 2 which gives you the option. The answer is yes, the complete organ as it is now will be available for Hauptwerk 2. 55 ranks over 4 manuals last time I counted!